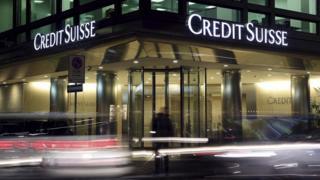 Credit Suisse is facing calls from an activist investor to split itself into three parts. The bank confirmed it had received a letter from Swiss hedge fund manager Rudolf Bohli, who holds a small stake in the company, about the plans. Credit Suisse is two years into a three-year turnaround plan under chief executive Tidjane Thiam. The bank said it "welcomed the views of all our shareholders" but was focused on Mr Thiam's strategy. Mr Bohli, who runs the activist hedge fund RBR, is understood to have suggested Credit Suisse should be split into an investment bank, an asset manager and a wealth management firm to increase the value of the group. The Financial Times reported Mr Bohli would unveil the plan at a conference in New York later this week, and has the backing of a former senior Credit Suisse executive. Credit Suisse has shifted its focus towards wealth management and away from investment banking under Mr Thiam, who took over in July 2015. The bank said its turnaround plan was "well on track" and would "unlock considerable value for our clients and shareholders".